This is a condition that I’m very familiar with, as my Diabetic Uncle suffered gout in his feet. I lived with him and my Aunt while attending University in Toronto and I was taxed with the duty to change the dressings on his foot each morning before leaving for school. The open sores were putrifying and I often had to hold my gag reflex in check. I have a great deal of compassion for these sufferers and maybe even more for their caregivers. My Uncle’s foot also appeared clubbed as he wore such bulbous shoes to accommodate the calcified mass encasing the metatarsal of his big toe. It sadly restricted his capacity to get around and he was always in pain, unless he was drinking. Gout has always been attributed as the rich man’s condition and was determined as the by-product of years of rich foods and alcohol coupled with poor elimination through the urogenital system. Men have traditionally been more affected by gout than women. Doctors will generally diagnose gout when they find an accumulation of uric acid in the blood. My Uncle drank no water, preferring Johnny Walker Red instead, and so the natural waste products were never flushed from his system and allowed to accumulate in the joints of his extremities. If you looked under the microscope of a gouty joint, you would see needle-like crystals, indicative of the inflammation and excruciating pain so indicative of this condition. The allopathic Physician will, sadly, tell his patients that the sudden attack of symptoms is generally not treatable, except to just manage the pain, using anti-inflammatory drugs. While he knows that it generally runs in your family, he won’t know why that is or what to do about it. However, with Heilkünst Medicine, we know which Genetic Miasm spawns these symptoms. It is also the root cause of chronic diseases such as heart disease, all types of arthritis, iritis, cystitis, otitis media, and kidney disease. Other clues leading to a diagnosis can be higher triglyceride levels in the body, high blood pressure (armoring), renal complaints, obesity, and a state of mind of mania, psychosis, living a polarity of extremes or to excess, and taking many risks. It can also show up as ganglions, tumors and gouty expressions of inflamed calcified joints. Most folks we talk to are not interested in compounding their issues with drug protocol since it does not have the capacity to cure the underlying cause; it just becomes a protocol of mere management of the symptoms and can contribute to a host of unwanted side effects. Our approach is to apply natural remediation to address the root cause and address the symptoms on the basis of the law of cure — like cures like. For example, pineapple contains enzymes and the substance bromelain and can be very effective as a natural anti-inflammatory. Flooding the system with vitamin C can also support the repair of healthy tissue around the affected area, in addition to cherry and nettle tea; the latter can be taken internally or made into a hot compress placed externally on the affected part. Something to be cautious about is building up the tolerance for Vitamin C slowly over time as it can occasionally precipitate the formation of kidney stones. Quercetin can also be helpful in treating the acute inflammation of gout as a therapeutic measure as it helps to naturally reduce the uric levels in the blood. It is a bioflavonoid that has strong antioxidant properties and other health benefits: it can inhibit platelet formation, and has anti-inflammatory properties. Blueberry juice, celery, avocados, cherries and onions, particularly the outer, brown skins, are a rich source of dietary quercetin and flavonoids. It has also been measured that substances called leukotrienes are present during an attack of gout and flaxseed can be instrumental in bringing the level of this chemical back to a viable level in the tissues. Herbal teas such as cat’s claw, devil’s claw and the those made from olive leaves can be great natural remedies to reduce the levels of uric acid naturally in the blood. Also, a diet high in essential fatty acids and oils, including flax, olive and coconut oil, can help reduce symptoms of gout. Flaxseed oil, one tbsp. daily in the morning with meal. Nettle, 250 mg three times daily of standardized extract. Vitamin C, 500 mg daily. Add 500 mg every five days until you reach 1,000 mg two times daily. If diarrhea develops, reduce the dose. Bromelain, during an attack 500 mg every three hours. To prevent further attacks reduce the dose to twice a day. Cherry fruit extract, 1,000 mg three times daily following an acute attack. Quercetin, 500 mg two times a day between meals. To help prevent gout attacks take with bromelain. Arnica is the quintessential remedy for pain and bruising. It can help with excruciating pain associated with a bruised-like feeling, especially when it comes to putting pressure on the affected area. The patient may feel exhausted from the prolonged pain. Belladonna is utilized for the treatment of inflammation and redness especially with a quick onset. There will generally be heat in the affected area, swelling and intense throbbing. The patient may be delirious with the pain. Berberis is a great remedy for the the treatment of kidney and urogenital diseases and may be accompanied with back pain on both or either side of the back. Look for stitching pains in the joints or an increase in pain when the patient shifts position. Bryonia‘s remedy picture includes swollen, stiff joints that are very hot to the touch. Also, the state of mind will be one of protracted grief, irritability, aloofness, and insecurity to engage with anything new or move forward in their lives. Calcarea fluor is for cracking joints and painful, stabbing sensations in the joints. These individuals are like barometers in that they are aggravated by changes in weather systems. The individual suffering these symptoms will generally feel better with warm compresses. Colchicum is a great remedy for excruciating pain in the big toe and the heel. If you were to touch the affected part, the patient may react violently. Physical symptoms include hot, swollen and inflamed joints which are very painful in the evenings and at night. You may also see a worsening in Spring accompanied by a persistent chill, fatigue or physical exhaustion. Ledum is a great remedy for anger and deeper tissue damage often associated with puncture wounds. There can be extreme shooting pains all through the feet or ankles radiating out and upwards towards the knees, causing further discomfort and pain. The patient may prefer cold, topical applications on the affected parts. Rhododendrum sufferers feel their symptoms worse before a storm where the right side of the body experiences more of the painful sensations. Theses can include aching and violent swelling of the big toe especially worse if the individual stays up too late at night into the wee hours of the morning. The patient can improve just with eating or by warming up or going to bed to sleep. Rhus tox is warranted when the joints become very hot, stiff and swollen. The extreme pain can actually lessen from gentle movement, but become worse in cold, damp weather. Sulphur can be called for in hot, itching, burning feet. The symptoms worsen if heat is applied. avoid drinking excess alcohol and coffee. These substances are a major cause of uric acid. drink a minimum of 8-12 glasses of water a day to help the body eliminate toxins and uric acid, flushing the kidneys and urogenital system. maintain a healthy weight and engage in exercise. Find something low impact and fun, like aquafit, aerobic activity in water. avoid rich foods not resonant with your blood type (see your Heilkünst Physician about this). 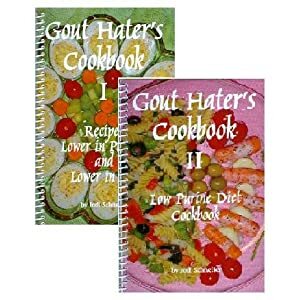 Typical foods to be avoided by gout sufferers can include high purine foods (beef, pork, and lamb) as well as organ meats (liver, kidneys and brain). consume foods resonant with your glandular and blood type. see a Heilkünst Physician to treat the root cause and eliminate the likelihood of manifesting symptoms in the first place.